Are we doomed to never get the right Onslaught? 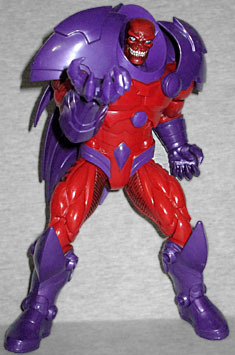 The first Onslaught BAF was in Marvel Legends Series 13, and it represented the character's secondary form. Now we've got one in the first series of Captain America Legends, and it's the Red Skull version from Uncanny Avengers. Back in 1942, Red Skull had Arnim Zola record his consciousness in a cloned body that would awake decades later, just in case Germany lost the war. Recognizing that his particular brand of old-fashioned hate would no longer fly, he decided to make America great again by targeting mutants. To aid in his quest, he exhumed the body of Charles Xavier and stole his brain, somehow giving himself psychic powers. He then taunted Magneto into killing him, which released Onslaught once again. 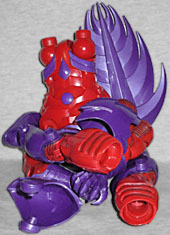 Red Onslaught is built from nine pieces - arms, legs, torso, head, cape and two bits of shoulder armor. Buy all seven figures in this series, and you can assemble the figure that the packaging uncreatively identifies as "Red Skull." I had trouble getting the left leg plugged in properly, which is the exact issue Absorbing Man had. How odd. On the plus side, buying the entire series won't leave you with any duplicate pieces - no need to unload extras later. The thing that separates Red Onslaught from Onslaught Classic is the head - instead of looking precisely like Magneto's helmet, this is Red Skull's face. Although, since this is a clone who hasn't been exposed to Death Dust, it's still just a mask. Then again, Magneto had just crushed that head with a pile of bricks, so who knows what's going on here? 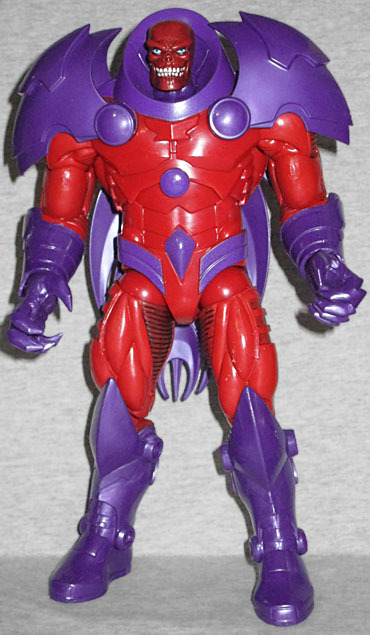 Other than the head, though, this is the Onslaught most people think of when they think "Onslaught" (not that many people have thought "Onslaught" since, say, 1997): the red and purple armor that couldn't say "I'm Magneto" any harder unless it was painted on his chest like a T-shirt. Seriously, villains get color-coded for a reason, so you can recognize them no matter what they wear; if Onslaught had been two-tone blue, we would have known he was Apocalypse; if he'd been dark blue and red, Mr. Sinister. But no, he's red and purple, and we're supposed to be surprised when we find out Magneto is involved somehow. Being an entity composed of pure psychic energy, Onslaught's design has necessarily been rather flexible over the years. So if the details of this toy don't exactly match the art of the comic, that's not a deal-breaker, ladies! Let's run the important parts: red body? Check. Silly purple shoulder armor? Check! Sharp, layered gloves with hooked fingers? Check! Huge collar, angular belt, boots with pointy kneepads? Check, check and check! There are some features from the '90s version, some features from the modern version, and even some (like the vents on the outside of the legs) that seem to come from Marvel vs. Capcom. He can be whichever Onslaught you want! The articulation is what you expect from a Marvel Legend. The head is a balljoint, to facilitate future swapping, but the neck hinge is very stiff and difficult to get going. The shoulder armor is hinged where it attached to the chest and back, so that it will move out of the way when you lift his arms. The biceps turn, but so do the elbows - why have both? A hinge at the elbow would have been enough. The wrists are swivel/hinge joints, but the gloves swivel too. The torso is a balljoint (a very stiff balljoint), the hips are swivel/hinge balls, and there are swivels at the top of the thighs. It's nice to see a large figure that doesn't shy away from double-hinged knees, but the shape of the armor on the front of his shins keeps his ankles from hinging forward, while the armor on the sides keeps them from swivelling. 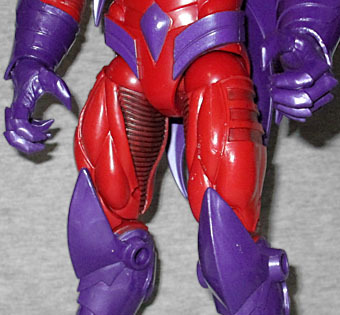 Red Onslaught comes with no accessories, because he uses no accessories. 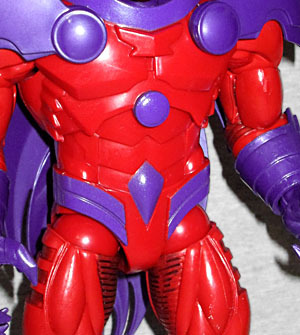 When this figure was first revealed at SDCC last year, there were hopes that he'd include a variant Magneto helmet, but no dice - as Rustin learned at the time, Hasbro is not restricted from making X-Men toys (sorry to burst your bubble, conspiracy theorists), but Marvel doesn't want X-Men characters in Avengers (or Captain America, in this case)-branded packaging. That's why the familiar red helmet will be included with the ML Rogue that's coming later this year. But even while you're waiting, this is a cool figure.